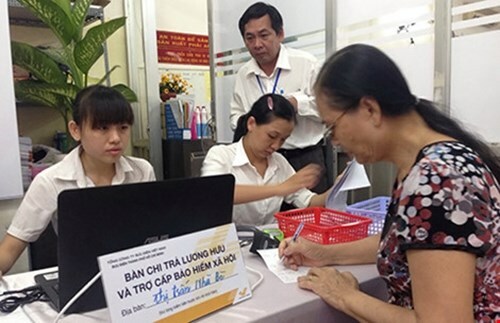 HCM City (VNA) - The HCM City Social Insurance Agency on May 4 began to pay monthly pensions and social insurance benefits to pensioners through post offices in a few more districts. It has added Hoc Mon, Cu Chi, Nha Be and Can Gio besides three wards of Tan Phu. Last July it had begun a pilot scheme to pay through post offices in Districts 1 and Binh Chanh. The new model is aimed at replacing the traditional one that requires pensioners to go to local people’s committees to get their money. Nguyen Thi Hong Lien of Nha Be district said it took her just five minutes to complete the paperwork and get her monthly pension at the Nha Be town post office. The post office workers were polite, Lien, who was among nearly 100 pensioners who went to the post office on May 4, said. The Nha Be post office is scheduled to pay around 500 pensioners every month. Nguyen Thi Thu Van, deputy director of the HCM City Post Office, said money would be delivered home to people aged above 80 and those who are sick for free. Cao Van Sang, director of the HCM City Social Insurance Agency, said most pensioners have expressed satisfaction with the service they receive at post offices nine months into the pilot programme. The procedures for pension payment have been streamlined to make them faster and more convenient, he said. A total of 5,217 people in District 1 have got pensions and social insurance benefits worth 21.1 billion VND (942,000 USD) at post offices in District 1 since last July. In Binh Chanh, 5.4 billion VND (241,000 USD) has been paid to more than 1,700 people.